Agile Game Development: Death Marches! The evil that won't let them die. Death Marches! The evil that won't let them die. Death marches are still an issue in the game industry. Game developers still face death marches (excessive crunch), which leads to burnout and exodus from the industry. I came close to leaving the industry in 2001, after the months of crunch leading up to our PS2 launch titles Midnight Club and Smugglers run. "Don’t be in the game industry if you can’t love all 80 hours/week of it — you’re taking a job from somebody who would really value it." "If working on a game for 80 hours a week for months at a time seems “strenuous” to you … practice more until you’re better at it." Even worse, he's shared this philosophy in this horrible presentation (don't be surprised if this link is dead...I'll find another). Who did he present this to? How common is this attitude? I'd write more in response, but Rami Ismail said it best. Teams should find a sustainable pace that they can work over the long term. This means working close to 40 hours per week most of the time with periods of crunch that don't last too long. How long should crunch last? There have been studies that show the real effectiveness of crunch. For us, the proof came the last time management enforced company wide overtime in 2005. We "asked" the teams to work 6 days a week at 10 hours a day to finish Darkwatch. The proof came from the velocity observed in burndown charts. The first week was a normal ~ 40 hour week. Weeks 2-5 were the 60 hour weeks. 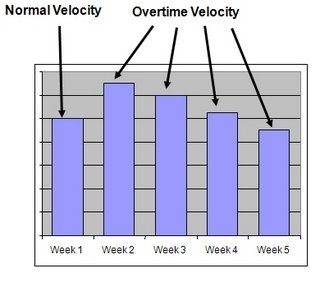 The first thing you notice is that the overtime in week 2 caused the velocity to greatly increase. More "stuff" was getting done! However the velocity decreased until we get to week 5 where the velocity was even less than a normal week! How is this possible? It's simple. People get tired. They make more mistakes. They lose the incentive to create value. Now, as a programmer, I love being in the "zone". I've worked 80-hour weeks on end on a game I was very passionate about and stayed in that highly productive zone. It never lasted more than several weeks and when I was done, I rested. The mistake that managers made is that the effect was the cause. They thought that forcing me to work 80-hours a week would put me in the zone. That's like forcing someone to smile to make them happy. It didn't work. This is what I love about agile...it creates simple empirical evidence about what works and what doesn't. This is why there is no "rule" about overtime. There doesn't need to be a rule. If your teams are truly using iterations to find the best way to work, they'll quickly discover that after several weeks of overtime, the value is lost and that pace should not continue. It becomes common sense. For more extensive information on this topic, check out Dan Cook's Presentation. *The terms "velocity" and "estimation" have bad reputations in agile circles these days, but a lot of it comes from how they are used.